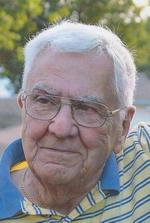 PATRICK L. FARALDI, 85, of Jackson Twp., NJ, passed away on Tuesday, September 25, 2018, at Community Medical Center, Toms River, NJ. He was born in North Bergen, NJ, and resided in Cresskill, NJ and Lakewood, NJ, prior to settling in Jackson Twp., 12 years ago. Patrick was employed as a Benefits and Compensation Executive for Exxon Corporation, NYC, for more than 20 years prior to his retirement. He was a communicant of St. Aloysius Roman Catholic Church, Jackson Twp., and a member of the Knights of Columbus. Patrick is survived by his loving wife, Patricia Faraldi of Jackson Twp. ; his sons, Peter Faraldi of Closter, NJ, and Joseph Faraldi and his wife, Allison of Barnegat, NJ; his daughter, Laura Faraldi- Hansson and her husband, Anders of Jersey City, NJ; his 3 grandchildren, Joseph, Nicklas, and Sofia; and by his sisters-in-law, Maria Lyons, Bettina Casabona, Nancy Casabona, and Susan Casabona. Arrangements are under the care of the GEORGE S. HASSLER FUNERAL HOME, 980 Bennetts Mills Rd., Jackson Twp., NJ 08527. A Memorial Mass will be offered at 10:00 AM on Saturday, October 20, 2018, at St. Therese of Lisieux Parish, 120 Monroe Ave. Cresskill, NJ 07626. Please gather at 9:45 AM at the church. If so desired, contributions may be made in Patrick’s memory to Spectrum for Living, 210 Rivervale Rd., Apt 3, River Vale, NJ 07675 www.spectrumforliving.org or to the Friendship House, 125 Atlantic St., Hackensack, NJ 07601 www.njfriendshiphouse.org and would be greatly appreciated. For further information and to send condolence messages to the family, please select a tab on the left.